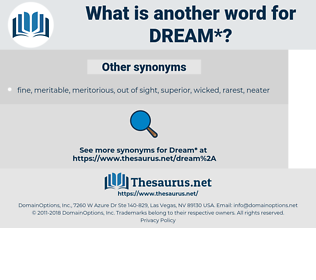 What is another word for dream? Thoughts or ideas occupying the mind during sleep; a vain fancy. most pie in the sky. NSS, Vis, chimera, slumber, aspiration, ideal, yearning, sleep, desire, ambition, delusion, sleeping, imagination. entity, certainty, concrete, reality, substance, actuality, fact, existence, truth. After that everything seemed like a dream. My dear, she said, I tell you it is not a dream. 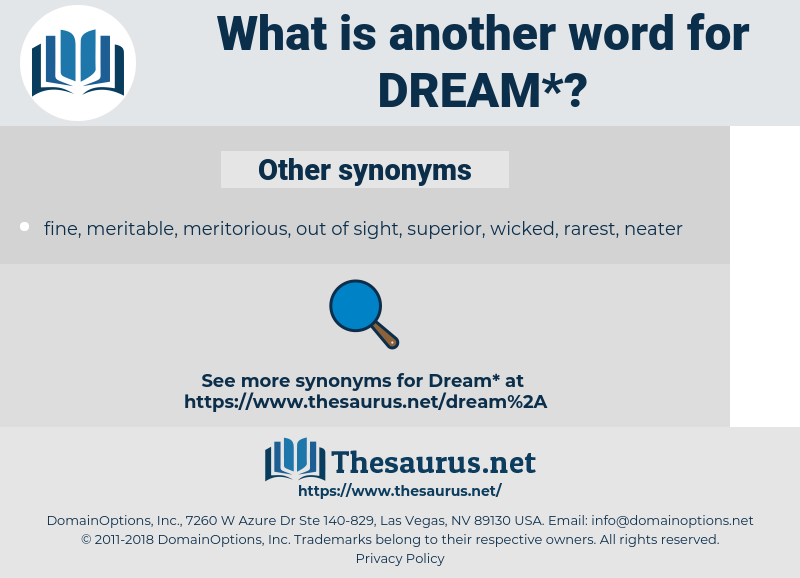 diorama, daydream, darwinian, deuterium, dirham, drum, dry run, deuteron, durian, durion, dehorn, derma, deuteronomy, dairyman, dormie, Drome, darn, dreamy, drawn, dharma, drown, drone on, draw in, dew worm, durham, dethrone, doorman, determine, drain, dorm, duramen, Dharhan, dramamine, dorian, diathermy, dram, detrain, durum, drama, dead room, derain, draw rein, dormy, drone, darwin. imagery, revery, imaging, mental imagery, imagination, reverie. flawlessness, perfection, ne plus ultra.